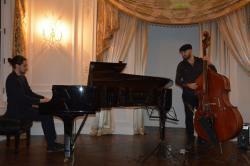 Azerbaijani jazz pianist Isfar Sarabski gave a spectacular concert in Paris on January 13. 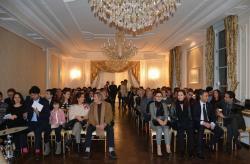 The concert was co-organized by the Azerbaijani Embassy in France and the European Azerbaijan Society (TEAS). Accompanied by Maurizio Congio (bass guitar) and Patrick Goraguer (drums), the pianist brilliantly performed “G-Man”, “Planets”, “Edge” and other music pieces. The concert was greeted with much acclaim. After the concert, French jazz lovers shared their impressions about the concert with Azertag. The spectators were impressed by the virtuosity of musician. “I enjoyed this concert very much. A young pianist had such a talent, his performance impressed me. This young pianist reminded the history of Azerbaijan, and told us about the wonderful future of the culture that has been created for centuries. Sarabski once again showed that Europe is indivisible and Azerbaijan is part of it,” said Member of the International Bar Association, lawyer Evelyne Stirn. “Azerbaijan is one of the best sustainable developing countries. Your country has a great future in the face of your youth, including Isfar Sarabski," said Former Minister and Secretary of State Olivier Stirn. Isfar Rzayev, better known as Isfar Sarabski, is the great-grandson of opera singer Huseyngulu Sarabski. His musical talent manifested itself at an early age. The musician began playing the piano at the age of seven. Sarabski studied classic piano for eleven years at the Bulbul Music School. After that, he continued his education at the Baku Music Academy. He completed his studies at the Academy in 2011, graduating as a classical concert pianist. In the same year the pianist received a scholarship from the Berklee Music College, Boston, the U.S.
Azerbaijan's young virtuoso has performed in the most prestigious concert halls, including the Royal Albert Hall, the Queen Elizabeth Hall, the Miles Davis Hall, the Vibrato Jazz Club, Jazz Club Ronnie Scott's, the Zinco Jazz Club, the Konzerthaus, Asphalt Jazz Club, Duc des Lombards Jazz Club, Porgy & Bess Jazz Club, Bird’s Eye Jazz Club and the Apollo Theater. By the way, Isfar Sarabski and Rain Sultanov will release a joint album. The album "Cycle" will be released on April 20.